Gainesville residents would like to thank the Alachua County Commission for its recent efforts to protect our families from the toxic health effects of the Cabot/Koppers Superfund Site. Their compassionate actions on our behalf stand in sharp contrast to the misinformation campaign being waged by the Florida Department of Health. The census review being paraded before the public as a “health study” is nothing more than a transparent attempt to excuse the department for decades of failure to protect residents from exposure to Koppers toxins. Published: Sunday, July 24, 2011 at 6:01 a.m.
Last Modified: Friday, July 22, 2011 at 11:32 p.m. I submit these comments on behalf of the multitudes of Alachua County residents whose lives have been damaged and even destroyed by Koppers contamination. My remarks concern the so-called FDOH Health Consultation released June 6, 2011. Your declaration that residents of neighborhoods surrounding the Cabot/Koppers Superfund Site have no increased cancer risk came as no surprise to us, only because we were forewarned by victims of other Florida Superfund Sites to expect misinformation tactics from your agency. FDOH is notorious for practices such as rubberstamping lies and manipulated data and saturating local media with it to lull communities into a false sense of safety while performing damage control. Fortunately, as in other polluted communities, the immediately affected residents here are not fooled by your transparent attempt to excuse your agency for decades of failure to protect Alachua County families from exposure to chemical contamination from Koppers. We reject your attempt to pass off the review of old, famously inaccurate census data as a genuine health study, your citing of non-existent health consultations as evidence, and your convenient failure to address any of the variety of other maladies known to result from toxic exposure that are prevalent in our neighborhoods, including, but not limited to, immune system impairment, respiratory problems, thyroid conditions, ms, lupus, chloracne, persistent headaches and nosebleeds, phantom itch, birth defects, stillbirths, and miscarriages- a list too long to name in full here. In the nearly thirty years that the Cabot/Koppers Site has worn the Superfund designation, your agency has never conducted an actual health study nor have you conducted any health consultations with affected residents. Yet now, you glibly, negligently proclaim that “There is no evidence to suggest neighbors of the Cabot-Koppers Superfund site in Gainesville are at an increased risk of developing cancer.” This type of propaganda and damage control by FDOH is irresponsible and a disgrace. Your agency knows perfectly well that proper, valid health studies take years to complete. They require thousands of people to be studied, tracking back over many generations, and must be designed and fully executed by scientists. Gainesville’s citizenry is very aware that we’ve been handed junk science. In conclusion, it is obvious that FDOH does not care about the many families that have had to abandon their homes for the protection of their children, or the young couples who have had to leave their homes after repeated miscarriages in hopes of starting their families safely elsewhere. You continue to completely disregard the pain and stress suffered by residents struggling with cancers and other equally lethal health issues despite decades of public testimonials. Therefore, the residents of Gainesville will have to conduct our own, real, health study. My name is Roy Geiersbach from the Stephen Foster Neighborhood. Colon, lung, kidney, thyroid, skin, pancreas, liver just to name a few of the cancers that are common in our neighborhood. Children born with missing parts such as lungs, kidney, stomach, short limbs and cleft pallet. Miscarriages and still births are also a problem. I and others, and some whom are now dead, have testified before you asking for help over and over for years. I don’t understand what YOU DON’T GET! about the fact that we are dying here! MANY HAVE DIED MANY MORE ARE SICK AND MANY MORE WILL DIE! CALCIUM DEPLETION IN BOTH MEN AND WOMEN, WHERE YOUR BONES EASILY BREAK, AND WHICH IS CAUSED BY CHEMICAL CONTAMINATION AS STATED BY SOME OF MY DOCTORS, IS A COMMON PROBLEM IN THE NEIGHBORHOOD. MANY HAVE THIS PROBLEM WHICH I ALSO HAVE, ALONG WITH MULTIPLE CANCERS AND OTHER ILLNESSES. I ask where is your compassion and humanity? You, our elected officials, have not spoken out in our defense. We are dying here! When will you stand up for us? We need and have been asking for your help! And yet you STILL don’t hear us. We don’t want excuses and please no more passing the buck. We need action in our defense, not worries that Beazer is going to sue the EPA or that the EPA won’t grant your request SO WHAT! THAT IS THEIR PROBLEM NOT YOURS. You need to ask for the best possible resolution and clean-up, for our city and its residents, especially the residents of the Stephen Foster Neighborhood. COMMISSIONER POE YOU HAVE NOT REPRESENTED YOUR DISTRICT WELL AT ALL YOU HAVE BEEN M-I-A, I REPEAT M-I-A! ON THIS KOPPERS ISSUE. WHEN IT COMES TO THE RESIDENTS THAT LIVE IN THE INFECTED AREAS! You have not defended us or spoken on our behalf or even called us to get our perspective. It is as if we don’t matter, we are just collateral damage to you. This is criminal, you our elected officials should be ashamed of yourselves. you continue to allow this massive travesty to go on just like your other predecessors and not demand permanent relocation of the affected residents. You are keeping us in contaminated homes! FROM ALL LEVELS OF GOVERNMENT AGENCIES THAT HAVE AND ARE INVOLVED IN THIS ISSUE. YOU HAVE ALL PASSED THE BUCK!!! AND SHAMEFULLY CONTINUED TO DO SO WHILE WE SUFFER, ARE SICK AND DYING. TOO MANY ARE LIVING IN HIGHLY CONTAMINATED HOMES THAT ALL OF YOU, CRIMINALLY IGNORE. REALTORS ARE NOW TELLING US THAT OUR PROPERTIES ARE UNSALABLE AND THEREFORE THEY ARE WORTHLESS PROPERTIES AND WON’T LIST THEM. SO PROPERTY TAXES SHOULD BE NULL AND VOID. YET YOU DEMAND HIGH TAXES FROM US. SOME OF OUR GOVERNMENT OFFICIALS HAVE NOT BEEN RESPONSIBLE AND ARE NOT RESPONDING IN THE APPROPRIATE MANNER THAT THEY SHOULD IN THE DEFENSE OF THE SICK, DYING RESIDENTS LIVING IN THE TOXIC CHEMICALLY INFECTED AREAS. THE FIASCO OF THE EPA’S MEETING ON AUGUST 5TH AT THE STEPHEN FOSTER ELEMENTARY SCHOOL! I ALONG WITH THE REST OF MY NEIGHBORS, WE THE IMMEDIATELY AND MOST AFFECTED RESIDENTS WERE CRIMINALLY DISENFRANCHISED AND NOT ALLOWED TO SPEAK BY THE EPA. THIS WAS AN OUTRAGEOUS, BLATANT, AND DISGUSTING, CRIMINAL SILENCING OF THE PEOPLE IN THE NEIGHBORHOODS. The EPA’s specially selected group and speakers, most whom do not live in the Neighborhood and DO NOT HAVE OUR BEST INTERESTS AT HEART AND DO NOT SPEAK FOR US! were allowed to speak for the full 2 hours of that meeting. When I went to speak the microphone was taken away from me by Ms. Latonya Spencer. When our President, Mrs. Sandra Kennedy, went to speak she was refused the microphone. She was them overcome with emotion because she was not allowed to speak on our behalf. IT IS OBVIOUS THAT YOU DON”T WANT TO HEAR FROM US! But you will have to, because we won’t back down. I’ve seen a lot in my lifetime, especially as a Vietnam Vet. I never thought this would happen to me in this country. This is CRIMINAL, YOU WILL NOT SILENCE US! Is this a Democracy? Are we a Third-World country? No one who lives outside of our neighborhoods that is not sick, ill dying, living in highly-contaminated properties whether renter or home owner speaks for us! Many people shouted from the audience to be allowed to speak, even some members of the specially selected group were heard shouting to let them speak. Many rushed to the front and demanded to speak, Mr. James Miller stood up from his seat and shouted also along with everybody else but he was the only one that was threatened by the police presence that was there at the request of the EPA according to Ms. Spencer. Mr. Miller is the only African American that stood up. One wonders if this is why he was the only one that was threatened by the Police. Almost 30 years of this is enough! We demand a Criminal Investigation and I hope that you, Mr. Poe, will do something for a change on our behalf. 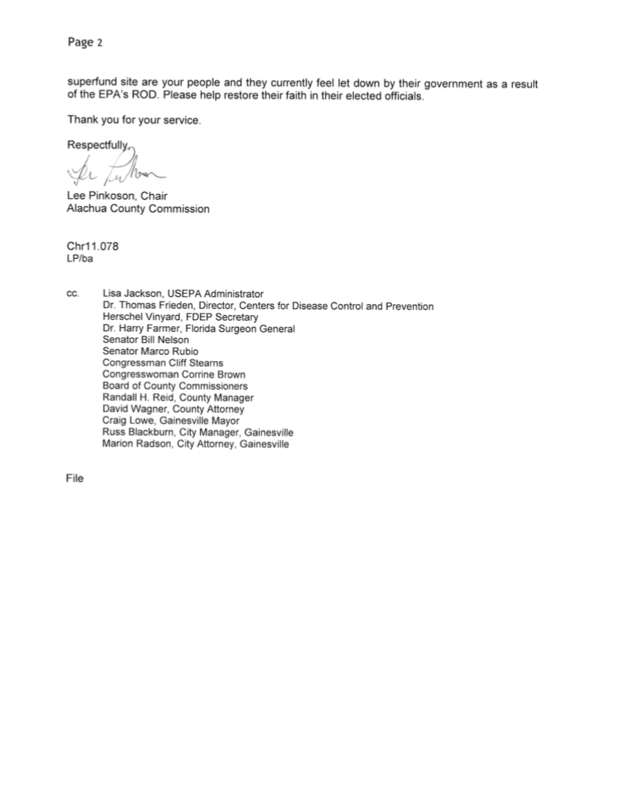 We demand that you write a letter of complaint to Mr. Meiburg at Region 4 EPA about the injustice that we had to suffer at the hands of Mr. Scott Miller, Mr. David Keefer and Ms. Latonya Spencer. They should all be fired. We want a copy of the letter when you send it. We also want you to stand up to the EPA in defense of your own neighborhood. It is time that you do so! And that request goes to all of the commissioners here tonight. I write regarding the Sun’s coverage of the recent so-called “cancer study” of the Stephen Foster Neighborhood. As a past Hospital Director of Nursing, as well as Director of Investigational Drug Studies, I am fully aware, through my education and extensive experience, how health studies should be designed, conducted, and so how their results should be determined and reported. The study was conducted in a manner that can only be considered unscientific, based upon data that cannot be considered complete or accurate. The Sun’s unequivocal headline screamed “No cancer cluster near Koppers”. It was, therefore, biased and misleading, since Florida’s Department of Health (DOH) never conducted a real health or cancer study. For starters, residents affected by the Koppers site include many more neighborhoods than just Stephen Foster, which the local, state, and federal spin-doctors just love to focus on to beguile and mislead the rest of Gainesville’s citizenry at large. Stephen Foster and other residents, past and present, have been dealt a grave disservice by the Sun and the DOH. We have never been asked directly about our health, nor in any meaningful numbers. Past residents have not been tracked, nor have short- or long-term renters been sought out, or included. The Sun reported that Anthony Dennis had determined, through study, that there were no greater risks of residents getting cancer in the Koppers’ area than in similar areas not near toxic Superfund sites. This type of propaganda and damage control by the DOH is irresponsible and disgraceful. All in all, the DOH’s so-called “study” is nothing but a chart compiled from inadequate, 11 year-old census data. The data came from census reports through the year 2000 and references were made concerning use of tumor registry reports. With regard to census reports, many residents, myself included, provided only the minimum information required by law. Moreover, many residents do not return their surveys. Information derived from such census reports are unscientific and are, therefore, in no way, “cancer studies”. Although reference was made to Tumor Registry reports, such data were not provided in the DOH report. In my professional capacity, I can attest to the fact that Tumor Registries are inaccurate, ignored, underfunded and, therefore, are highly flawed when attempting to draw useful conclusions from them. It is widely known that the Joint Commission and the State Surveyors spend little time on Tumor Registry systems, policy and procedures. Indeed, in past surveys, the phrase “Tumor Registry” was never used by either group in any survey with which I was intimately involved. Proper and valid health studies take years. They require thousands of people to be studied, tracking back over many generations, and must be designed and fully completed by scientists. Bottom line, Gainesville’s citizenry have been handed “junk science” and the Sun has blithely aided and abetted the furthering of this propaganda. I write on behalf of the multitudes of residents whose lives have been detrimentally impacted by Koppers contamination, and want to ensure that this statement is placed firmly in the Public Record. It will be, since I am emailing this within the Public Record as well as copying it to various parties for their information and files. This untruthful, devious proclamation prompts residents to ask whose interests Mr. Dennis and FDOH truly represent. 1. The attempt to pass off the review of old, notoriously inaccurate census data as a genuine “health study”. 2. The citing of non-existent health consultations as “evidence”. 3. Dennis’ and FDOH’s deliberate, irresponsible saturation of local media with lies and manipulated data. 4. Their convenient failure to address any of the variety of other maladies prevalent in our neighborhoods that are known to result from toxic exposure, such as immune system impairment, respiratory problems, thyroid conditions, ms, lupus, chloracne, persistent headaches and bloody noses, phantom itch, birth defects, stillbirths, miscarriages- a heartbreaking list too long to name in full here. The census review being paraded before the public as a “health study” is nothing more than JUNK SCIENCE- and a transparent attempt to excuse FDOH and Mr. Dennis for decades of failure to protect residents from exposure to Koppers toxins. To wage a propaganda campaign on the uncounted graves of the victims of the state’s inaction will never be acceptable to the families of the many who have died, the many who are presently ill and the many more that will die. We, the immediately affected, will NOT BACK DOWN on our DEMAND for permanent relocation out of harm’s way and our dioxin-contaminated homes. PUBLICALLY RECOGNIZING THE ONGOING NEGATIVE EFFECTS OF THE CABOT/KOPPERS SUPERFUND SITE ON LOCAL RESIDENTS AND THE FLORIDAN AQUIFER, ALACHUA COUNTY COMMISSION SENDS SOS TO OBAMA! ON JUNE 172011, THE ALACHUA COUNTY COMMISSION (BOCC) SENT A LETTER TO PRESIDENT OBAMA, ASKING FOR EXECUTIVE INTERVENTION IN ORDER TO EXPEDITE THE RELOCATION OF AFFECTED RESIDENTS AND THE PROTECTION OF GAINESVILLE’S MUNICIPAL WATER SUPPLY. 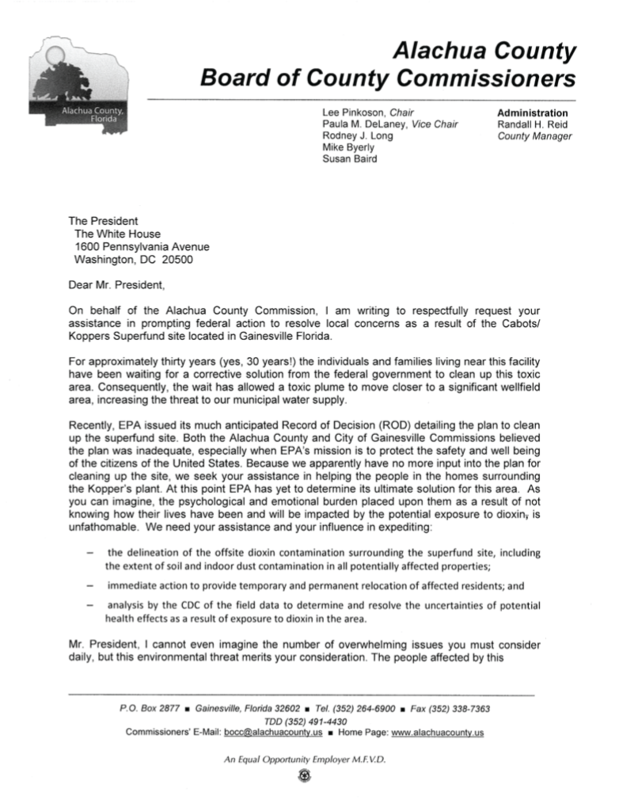 ON JUNE 17 2011, THE ALACHUA COUNTY COMMISSION (BOCC) SENT A LETTER TO PRESIDENT OBAMA, ASKING FOR EXECUTIVE INTERVENTION IN ORDER TO EXPEDITE THE RELOCATION OF AFFECTED RESIDENTS AND THE PROTECTION OF GAINESVILLE’S MUNICIPAL WATER SUPPLY.